Till Om Shanti Om was released last year, Vishal and Shekhar were generally known as emerging composers though they have been composing music for over seven years and their songs in such films as Salaam Namaste and Honeymoon Travels had become very popular. But in Om Shanti Om, they showed that they were excellent at composing sweet and lingering melodies as well as the energetic Dard-E-Disco number. Vishal Dadlani, who is touring over a dozen cities in North America and Europe with his partner Shekhar Ravjiani with the Unforgettable team, says their music owes a lot to the songs of the 1970s and 1980s. "Never mind what the subject of a film is," he says, "we want to make sure that every composition of ours has a good melody." He has also said the musical scene in the 1960s had seen good relationship and healthy competition between the composers but in the subsequent decades there sere attempts by a few composers at undercutting other composers. 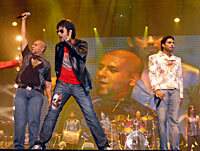 Vishal hopes that Shekhar and he could compose in a world without unhealthy competition and rivalry. "We want to follow the stalwarts of yester years and be known for our work," he asserts. What happens in the case of a film where they think the music is good but listeners and critics disagree? "We try to learn from our experience," he says, "but there is no point doing too much of introspection and agonize over something. We love to move on." Amitabh Bachchan, who is leading the Unforgettable team, says he marvels at their versatility. Farah Khan, who made great use of their music in Om Shanti Om, has said she was astounded with the choice of tunes they gave her. Amitabh Bachchan has said, "Vishal and Shekhar are a great combination, great music directors. I have had wonderful times sitting in their studios in Mumbai and choosing the tunes (for the Unforgettable tour). And to see them now perform live has been a great revelation for me." How does the Unforgettable tour compare to the other musical events you have performed? Performing before a large audience, say 10,000 people, is not anything new to us. We have performed at many venues in India. But here we are part of a three and hour long show, and together we sing half a dozen of our songs. No, we perform the songs. We perform songs from some of recent hit films especially Om Shanti Om. The challenge is that we should be able to hold our own performance high despite being on the stage with the acting legend of our times, Amitabh Bachchan and a number of other stars, Abhishek, Aishwarya, Preity Zinta, Ritiesh Deshmukh and Madhuriji. (Laughs). We sing, we dance, and we jump across the stage. But there is a rhythm to everything we do. And there is also spontaneity. We have to energise the audience. Shekhar and you are close to both the Bachchans. We worked with Abhishek for the first time for the film Bluffmaster three years ago but before I say something more let me tell you that I think one of the reasons I became a composer is because of Amitabh Bachchan. I was two years old when I saw Sholay and I got to see it again and again as I was growing up. Among the many things I could not forget in the film was the character played by Amitabh Bachchan and his death scene. It shattered me completely. Every time I saw the film again and again in my younger years, I thought he would not die for once. But how does music come into all this? How did you get to work with Amitabh Bachchan? The album is primarily that of Abhishek. But Amitabh Bachchan will have a song or two in it. He is a guest singer and surely he will be adding prestige to the album. We should be able to complete the work on it in a few months. It does not have a title as yet but we will be finalising all those details soon. What do you admire most in Amitabh Bachchan as an artist? His total dedication and how he keeps his body fit. On many days, while preparing for this tour I have seen him come from the gym, spend time with us and the organisers of the show, rehearse for a few hours, and then go to the shoot, and return in the evening. Do Shekhar and you always work together? I had the basic melody with me for quite some time. I used to play it on the piano. Shekhar took it to the next level. Both of you sing in the movies, too. I am not a good signer, Shekhar is. Though I love singing, I don't go out and ask a director to keep my song in a film. So how do you songs make into the films? Let us say I have made a scratch. A demo song and I think the producer or director likes it. There are occasions as in the case of the forthcoming film Dostana where the director Tarun Manuskhani wanted a new voice. We tried several singers but it did not work out. So my song remains in the film. We expect Dostana to be a big hit. It is produced by Karan Johar and it has a good star cast, Abhishek, Priyanka Chopra, John Abraham. We are eagerly waiting for its release. What would be special about the film's music? The film is set very much in America, much of it was shot in Florida. Usually you have American pop influencing the score. But we went for European pop. He lives for most part in Bangalore. He is a shy person but we all know he is very talented. When we met him in Mumbai, we did not discuss the tune with him the first day. He had a cold that day. We talked about everything else other than the movie and the song. But the second time, he heard the tune and he was ready to record it. We believe everything about this film is beautiful. Bachna Ae Haseeno is the kind of film Shekhar and I would have loved to make for ourselves. It is romantic, beautiful, fast-moving and it has a heart. This is the third time we are working with director Siddharth Anand. I think he has made his best film now. Our music has been very well used in the film. Were you surprised at the enormous popularity of your music in Om Shanti Om? We had worked very, very hard on the score but the music became huge hit also because the film was a great hit. True. We grew up listening to that kind of music. But we also wanted to make sure the songs in the film would appeal to a new generation. What was one of the toughest challenges for you in Om Shanti Om? Composing the song Dhum tara. It was a folk song and we had to create not only a nice tune but give it a beautiful beat. Many people think it was composed by Pyarelal (the legendary composer of the Lakshmikant-Pyarelal duo). It was solely our tune. Pyarelalji orchestrated it and did a great job with it. But if people think it is his tune, we let it be. But since you specifically asked about it, I am telling you this. How much are you influenced by a film's director? We work totally for a director. We follow the director's vision. The more imaginative the director is and the more time the director spends with us, the better our compositions will be. We interpret a director's vision. Who are some of the composers you admire most? Recently I have been hearing a lot of the awesome melodies by Madam Mohan that were composed from the 1950s through the 1970s. I can't recollect the film's titles but the songs will stay in mind forever. I have also admired the work of Salil Choudhry and the Burmans, S D and R D. Of course, there are other composers too.